A potato bug, sometimes referred to as a Jerusalem Cricket or Child of the Earth, is a small several inch long insect found in organic material such as potatoes and other crops. The potato bug likes to live in moist conditions and has an unusually large head compared to its body and emits an unpleasant odor. Maybe you’ve heard about a so-called “alien” bug in the news recently. It’s known for its human-looking head and large jaws, and it’s called a potato bug. Actually, the term potato bug can refer to two different insects. The strange, alien-looking potato bug is also known as a Jerusalem cricket. The Jerusalem cricket, scientific name Stenopelmatus fuscus, is a large wingless insect found throughout portions of the southwest United States. Meanwhile, there’s another potato bug, the Colorado potato bug, scientific name Leptinotarsa decemlineata. The Colorado potato bug is also found throughout the Southwest US, but it has since distributed itself far and wide, and can now be found all across the US and throughout much of Europe and Asia. Both kinds of potato bugs have different characteristics, but they both feed on potatoes, naturally. 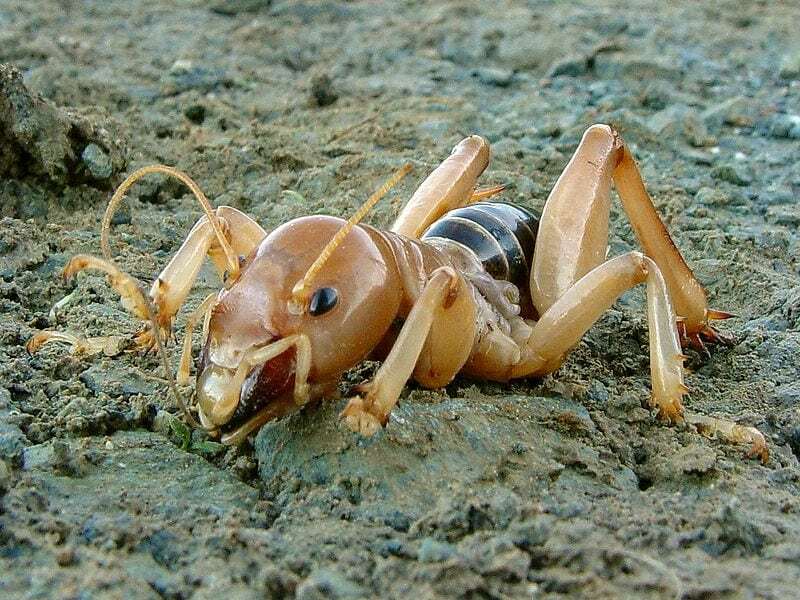 The Jerusalem cricket really does have a bizarre, alien-esque appearance to it. They have long, yellowish thoraxes with abdomens that typically have stripes or splotches which alternate between black and brown. Jerusalem crickets can grow up to two and a half inches long, and they have long spear-like legs that they dig into soil with. Complicating the already hazy distinctions of the term potato bug, the term Jerusalem cricket is often used to refer to a wide variety of different insects in the Stenopelmatidae family. Despite their name, Jerusalem crickets aren’t native to Jerusalem, and they are in fact mainly found in the western half of the United States. (Incidentally, they aren’t true crickets either.) They can be found throughout Arizona, New Mexico, and all along the Pacific coast of the country, being found all the way from British Columbia down to Baja California and many other parts of Mexico. Habitat wise the Jerusalem cricket mainly lives in underground burrows, but they can be found above ground in warm damp places. The Jerusalem cricket is pretty harmless to humans, as much as its large size tends to unnerve people. The insect isn’t poisonous, although it can leave a painful welt with its bite. While the Jerusalem cricket isn’t a true cricket, like a cricket it does produce a song when mating. The Jerusalem cricket bumps its body against the ground, producing a drumming rhythm that is intended to attract mates. The insects can also hiss to ward off potential predators, though they don’t do it like other hissing insects do. Other hissing insects typically hiss by forcing air through their abdomen, just like hissing cockroaches do. By contrast, the Jerusalem cricket produces a scratchy hissing noise by scraping its hind legs across its abdomen. Though Jerusalem crickets have been dubbed potato bugs because of their tendency to eat potatoes, potatoes are actually not their preferred diet. Jerusalem crickets actually prefer to eat smaller insects, fruits, and the roots of plants other than potatoes. That said, the Jerusalem crickets can indeed be found eating the tubers and roots of potato, though far less frequently than their name would imply. They have occasionally done damage to potato fields, but they aren’t considered a primary pest to potato plantations. Jerusalem crickets are capable of causing severe damage to crops if large groups of them descend upon a potato field though. Pesticides are one of the primary ways farmers deal with the bugs, though trapping and baiting them is also effective. The Jerusalem crickets can also be deterred by removing objects which they can hide in from a field, such as rock piles or wood piles. 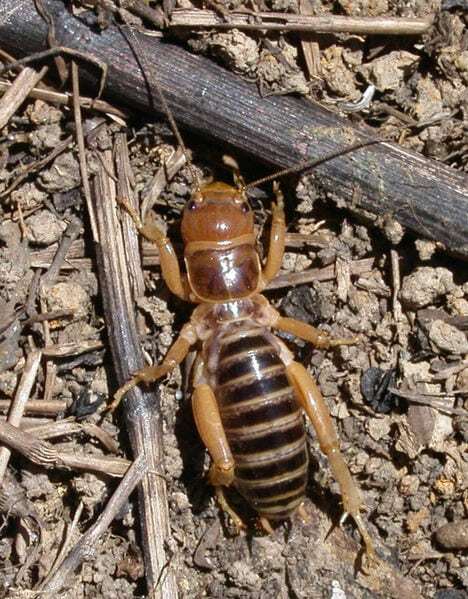 By contrast to the odd look of the Jerusalem cricket, the Colorado potato bug looks much more like a typical beetle. They are around half an inch long and have black vertical stripes on their yellow bodies. They’re oval shaped, and unlike the Jerusalem cricket, they are capable of flying. The native range of Colorado potato beetles covers most places in the continental United States except for California and Nevada. As mentioned, the beetles have spread far beyond this original territory and can now be found in most of Asia and Europe. The Colorado potato bugs stay deep underground for the cold winter months, emerging during the spring to lay eggs on the underside of leaves. The Colorado potato bugs become active during the spring at about the same time potatoes begin to emerge from the ground and grow their tubers. The adult insects stick around the potato fields to feed for a little while, and then begin to mate with one another. A female Colorado potato bug is capable of leaving behind 10-30 eggs on a single leaf. The lifetime of an adult female Colorado potato bug is typically a few weeks long, depending on variables like temperature and humidity, and during this time the females can lay up to 350 eggs each. Consider that there already tend to be hundreds of eggs hatching and you can see how the problem can multiply exponentially. While the Jerusalem cricket isn’t considered a major pest to potato farms, the Colorado potato bug really does damage potato crops quite frequently. The bugs feed on the potato plants and their lifecycle is dependent upon them. During the spring the potato bugs lay eggs on the underside of potato leaves. When the larvae hatch from the eggs, they then feed upon the leaves of the potato plant. They can also feed on other plants like eggplants, peppers, and tomatoes. Colorado potato bugs can be a very difficult pest to manage. Widespread and indiscriminate use of pesticides has created populations of potato bugs which are resistant to pesticides. For this reason, potato farmers should use integrated pest management plans. The bugs can be handpicked off of plants if they are in a smaller garden. Using natural predators of the bug like birds of the shrike family and ladybugs can help keep their numbers in check. Rotating crops and using microbial defenses can also help reduce overall numbers of the pest. Researchers are even exploring genetic engineering as a possible defense for crops. So while you may have encountered the Jerusalem cricket and been unnerved by its odd appearance, don’t worry as they pose very little threat to humans. Also remember that the term potato bug can refer to a different insect entirely, so try not to be confused if their description doesn’t match the potato bug you are thinking of. Also, remember that despite the nuisances they cause humans, insects remain an important part of our ecosystem.